Taco Night is serious business around here, but sometimes, I want to kick it up a notch. 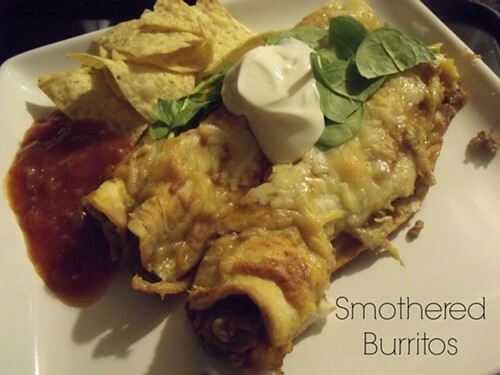 That's just what I did with this smothered burrito recipe. It's taco-ish enough to keep the kids happy, and you can make it work with whatever you have in the pantry. Switch out the beef for shredded chicken or the refried beans for black beans. Leave the green chilies out or add in more. Make these burritos your own. It looks like a big, cheesy, gooey mess in my photo. But it's a tasty mess! In a large saucepan, melt butter. Stir in flour until smooth; slowly add in water. Bring to a boil and stir for about one minute, or until thick. Stir in chili powder, cumin, salt and pepper. Reduce heat and simmer for about 10 minutes. In a large skillet, cook the ground beef, onion and garlic over medium-high heat. Drain meat, if needed. Stir in refried beans. Spread 1/4 cup of the sauce into a greased 13x9-inch baking dish. Spread a spoonful of sauce over each tortilla, followed by a heap of the beef-and-bean mixture and a sprinkle of cheese. Roll up and place seam side down in the dish. Pour remaining sauce over the top and sprinkle with remaining cheese. Bake, uncovered, at 350 degrees for about 30 minutes. Serve with toppings as desired. We like ours with salsa, chopped fresh baby spinach and a heap of sour cream.